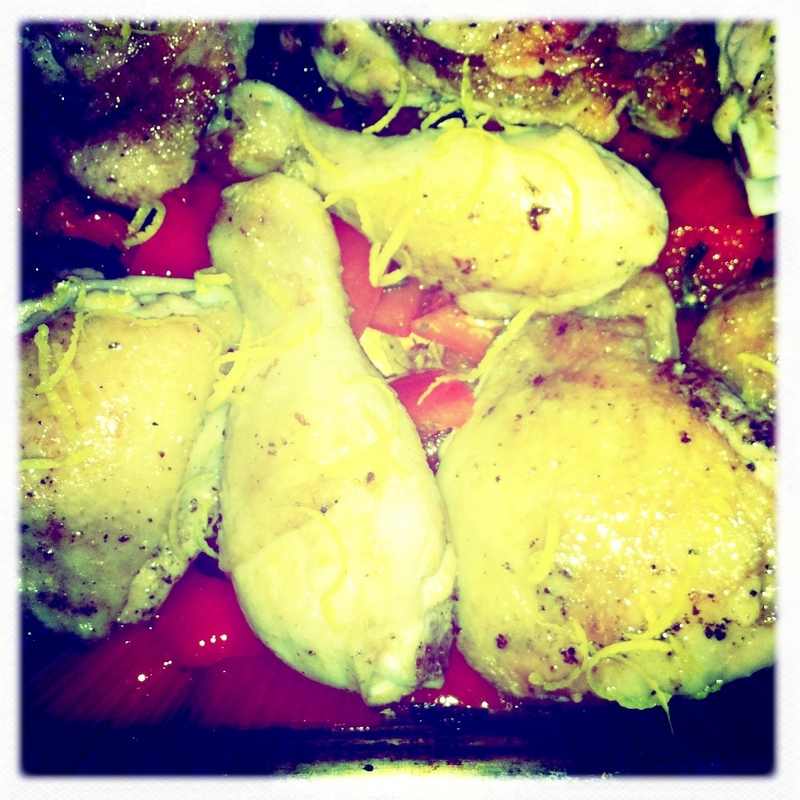 CHICKEN, RED PEPPER & CHORIZO | YUM YUM PIGGY'S BUM...! I’ve been in a retro mood recently admiring my boyfriend’s phone photos using the Hipstamatic application which makes your photos look like you’ve used an older film type camera with different effects. Awesome application and thought I’d try Hipstamatic out on this occasion. Chicken, red pepper and chorizo dish prepared and ready for the oven. It’s been so lovely and sunny this past week. Thought it’d be best to do a minimal amount of cooking this evening but still produce a delectable, flavourful dish with simple, complementary ingredients so I could spend the majority of the evening out in the garden. A recipe by Michelin-starred chef Angela Harnett did the trick, can’t always afford corn fed chicken so used thighs and drumsticks instead. I served this dish with rice so this would soak up the tasty chicken and chorizo juices. Well what can I say? Both my boyfriend and I tried to restrain ourselves as this is a recipe for 4 people, needless to say, most of this was scoffed. Though I managed to save a few pieces of chorizo and pepper and poured this over some rice and ate this for lunch the next day. Season the chicken well with salt and pepper. Heat one tablespoon of the olive oil in a large non-stick frying pan and brown the chicken on both sides for 4–5 minutes. When all the chicken pieces are golden, remove them from the pan and set aside. Preheat the oven to 180C/fan 160C/gas mark 4. Cut each pepper into four lengthways and discard the stalk, seeds and white flesh. Roughly dice the peppers into 2.5cm (1in) squares. Heat another tablespoon of olive oil in a frying pan and cook the chorizo for 2–3 minutes. Add the peppers, garlic, sage and thyme to the pan and cook for another 2 minutes. Pour the chorizo and pepper mixture into a roasting tin and place the chicken pieces on top. 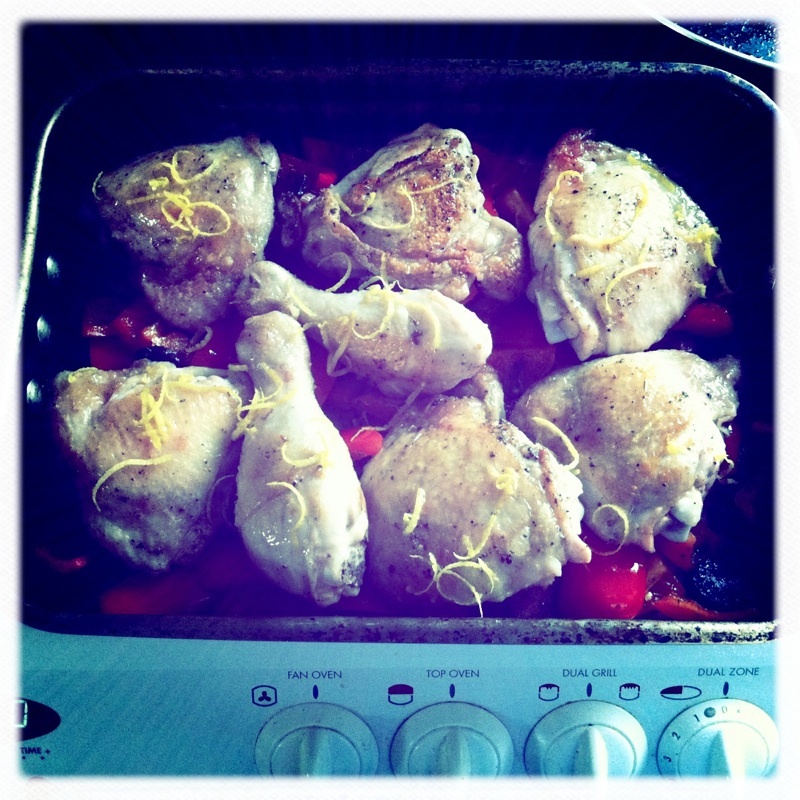 Zest the lemon and sprinkle over the chicken, then cut the lemon in half and squeeze over the juice of one half. Bake in the oven for 40–45 minutes, turning the chicken pieces halfway through the cooking time.